Following in David Tennant’s footsteps is no enviable task, considering the popularity surrounding his turn as the tenth incarnation of Britain’s popular time traveler. 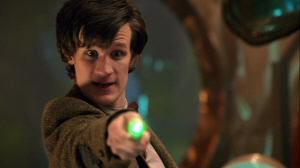 In a ballsy move, the show runners opted to cast the relatively unknown Matt Smith to fill the role, giving the Doctor a younger appearance and displaying wide-eyed enthusiasm to match. 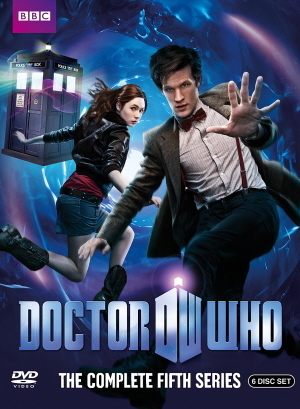 With a new companion (Karen Gillan) to call his own, the Doctor sets off on a series of new adventures, crossing enemies old and new alike, on his way to saving the universe. Considering the epic nature in which the fourth series drew to a close, there wasn’t just pressure on Smith but on the creative staff to deliver a new series that could top the last. New show runner Steven Moffat deemed taking chances necessary and indeed chances were taken as the writers decided to test the Doctor with a host of ordeals that included but weren’t limited to a crack in time and space and an alliance of his greatest enemies. The season puts the Doctor through the proverbial wringer, pitting him against everything from Cyber Men, to Daleks, and even the fan favorite weeping angels. Smith plays up the Doctor’s goofy behavior with the quirkiness and eccentricity of a man child. However when things hit the fan, he gets serious, going into full on hero mode as he casually makes threats to those unfamiliar with whom their dealing with or declaring his hatred for past enemies by smacking them with a wrench. The series has its fair share of camp, with the over the top performances and less than generous special effects, but that adds to its charm. Seeing a dog’s growl come out of a man’s mouth could be laugh inducing in lesser hands, but the show runners know whom their audience is, sticking with the tried and true formula of creating the most outrageous alien life forms possible, capturing the audience’s imagination so as to blind them to the lacking special effects. The DVD hosts a variety of extras with several deleted scenes, video commentary, and video diaries. There’s the standard back patting going on but its kept to a minimum, with the focus on the making of the series and it’s celebration of what has come before being enlightening and entertaining for long time Who fans. The usual Doctor Who Confidential is also imported over with 3 hours worth of content. The fifth series brings a lot of change to the long running show. The show takes a fresh approach, in doing so making the series accessible to new fans while making sure to leave enough of a hook to ensure the return of long time fans. 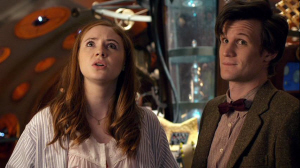 While the series does enter moments of childishness, viewers should remember that the series, this season moreso than others, is like a fairy tale, echoing the adventures of Peter Pan, with the Doctor playing the role of Peter and his companion Amy taking on that of Wendy as he whisks her from one world to the next. Filling Tennant’s shoes was no easy task but Matt Smith managed to do just that. With the assist of Steven Moffat, the series was reinvigorated. While the special effects are still wanting and the series still gives off a cheesy vibe, it’s all in good fun, providing a perennial feast for sci-fi fans and those on the hunt for some nonsensical excitement.